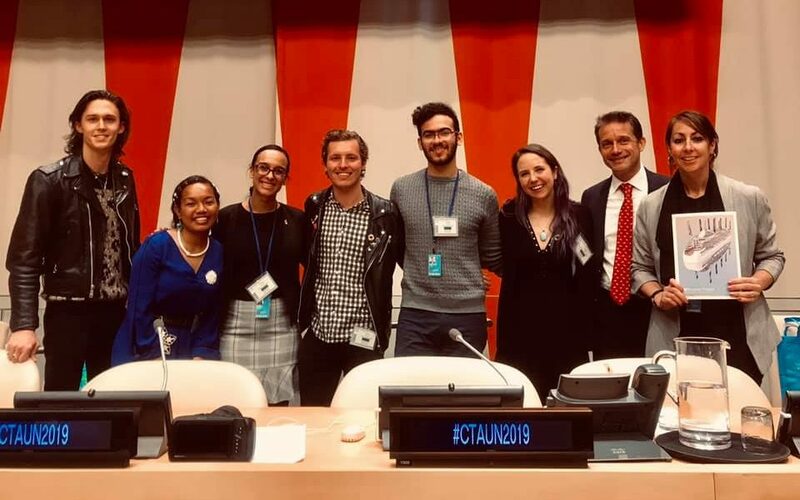 Peace Boat US convened a panel discussion about oceans and climate action at the Annual Conference of the Committee on Teaching about the United Nations (CTAUN) on April 5, 2019. Along with a delegation of youth advocates for the Sustainable Development Goals (SDGs), the Peace Boat US team spoke in the ECOSOC chamber of the United Nations Headquarters to more than 600 people attending the conference. Presenters shared information and materials addressing ways in which teachers can affect positive change in their classrooms, highlighting current environmental issues, and showcasing efforts underway by UN agencies, governments, NGOs and individuals in finding solutions. Peace Boat US Director Emilie McGlone spoke about how Peace Boat became a flagship vessel for promoting the UN Sustainable Development Goals as it sails around the globe. Selina Neirok Leem, a Peace Boat Ocean and Climate Youth Ambassador from the Marshall Islands, then performed a poem that she wrote, “More than just a Blue Passport,” receiving a standing ovation from the audience. 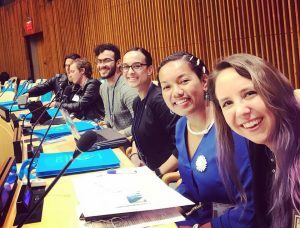 Filmmaker Ryan Carl followed her introduction and showed the short film that he created featuring the Ocean and Climate Youth Ambassadors, highlighting how youth activists are fighting to protect their homes, Large Ocean States – often known as Small Island States. 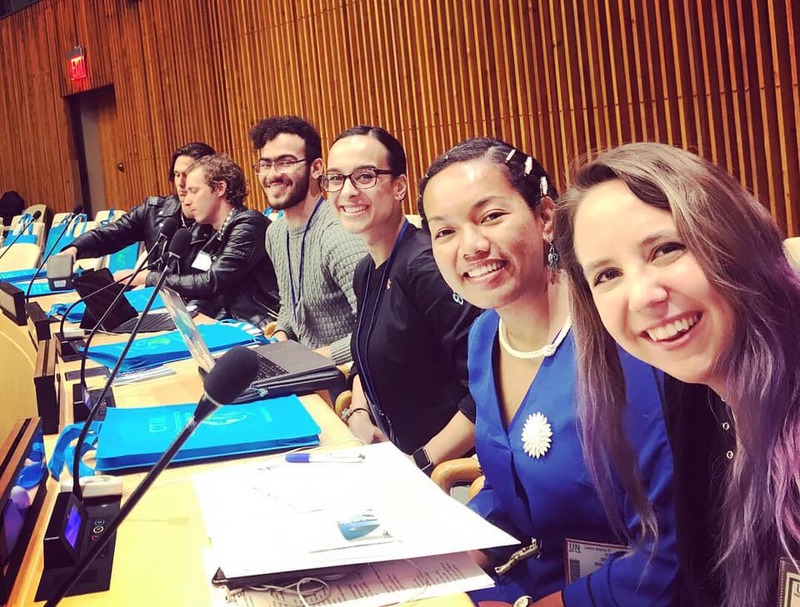 Sara Van Eerde, who recently joined Peace Boat’s 100th Global Voyage as a “Youth for the SDGs” scholar, spoke about her experience onboard and working at Global Kids as a social justice educator and social worker. 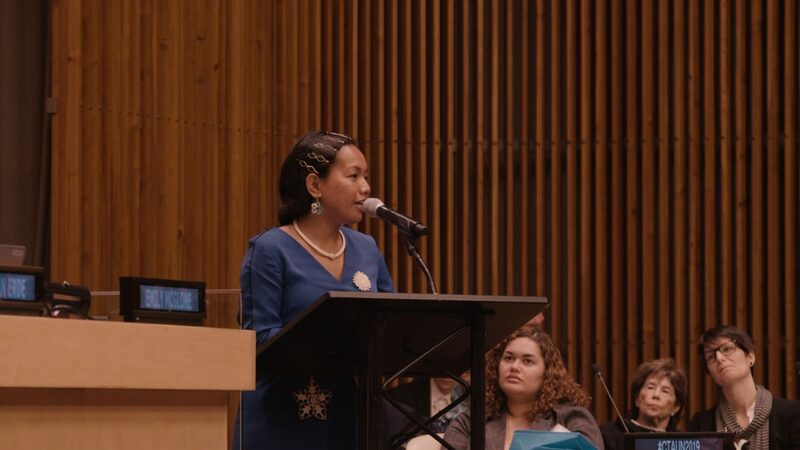 She then invited everyone in the ECOSOC chamber to join her in a rally on April 18 to protest the Williams Pipeline that is being considered to be placed from Pennsylvania to New York. 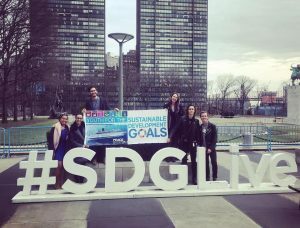 Hansier Rodriguez, a Rutgers University student and fellow “Youth for the SDGs” scholar on the 100th Voyage, shared his experience learning about SDG 7 for renewable energy while travelling with Peace Boat between Ushuaia, Argentina and Valparaiso, Chile, and explained the work that he continues to do at Rutgers to promote sustainability. The presentation concluded with a video of Peace Boat’s transformational project: Ecoship. This boat will be a low-carbon cruising model, using cutting-edge green technology to sail around the world fully embodying the Peace Boat message with a 40% cut in carbon emission, utilizing solar and wind power. As well as this session, the Peace Boat US team spoke with CTAUN attendees at the Peace Boat table throughout the day, answering questions about the Peace Boat experience, life on the ship, the Ecoship, and ways to get involved as a participant or volunteer onboard. The team also spread the word about the next exciting event for World Oceans Day. Peace Boat will dock in New York City on June 7 and 8 as part of its 101st Global Voyage, and will host a range of events onboard alongside partners from the United Nations and civil society organizations working to protect the world’s oceans. These events will involve youth-focused activities, talks, film screenings and performances, all focused on how civil society can come together to continue working towards protecting our ocean resources and climate action. ← Peace Boat Celebrates World Oceans Day in New York!